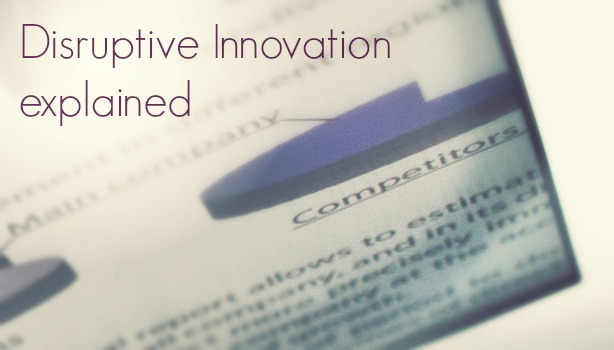 Disruptive Innovation involves simplification. Clay Christensen, who coined the term, didn't quite put it that way, but explained how his theory represents the transformation of a complex and expensive product used by experts into something more accessible for a larger population. In this way, it is also a strategic move. By targeting the bottom of a market with simplicity, the innovation disrupts the legacies of overly-complicated and costly competitors. You may enjoy hearing his examples in the following video. Consider the legacy of Facebook which has recently been threatened by disruptive mobile apps like SnapChat -- an app that allows users to send photos or videos that vanish after a few seconds. The mobile developer has received considerable investment and by February the company was valued at around $60m. Dennis Phelps of IVP, one of SnapChat's new investors, told The Guardian that the app "creates a sense of excitement and an urgency of consumption that is rare in this era of information overload." The app seems to have replaced the teenage enthusiasm one reserved for Facebook (see Pew Research cited by Reuters). With a simpler form of mobile sharing, the app is attracting an entire demographic away from Facebook, so is certainly disruptive. Data is only available about the past. When we teach people that they should be data-driven, fact-based and analytical as they look into the future, in many ways we condemn them to take action when the game is over. The only way you can look into the future there's no data, so you have to have a good theory and we don't think about it, but every time we're taking action its predicated upon a theory. So by teaching managers to look through the lens of the theory into the future you can actually see the future very clearly and I think that's what disruption has done. Applying the theory requires a shift in strategic thinking that accounts for overlooked markets and unforeseen changes in consumption. We would suggest that using market intelligence can identify those trends in consumerisation which data may indicate are gaining some interest, while keeping in mind that predicting if there will be disruption is more an act of human intuition and insight. Anticipating change by relying on data-driven strategies may keep the boat steady, but to win the race, your sails must also be open to the winds of disruption. These disruptive winds may arise from anywhere, so it is vital to keep your sails of market intelligence open across sectors. To stay afloat, simplification may be required to keep your services in tune with what customers want.